Mitzie’s paintings are eye-catching for their vibrant sense of colour and dynamic composition. She paints landscapes, townscapes, flowers and abstracts and prefers to work spontaneously and in a manner where the medium can flow. Mitzie has a strong bias towards tactile effects and a sensuous expression. She loves experimenting and for her acrylic paintings prepares a background from different types of paper including newsprint to give her a messy surface to work against. From this mess she establishes order and meaning. She has a Diploma in Stitched Textiles and a Degree in Painting and Printmaking. 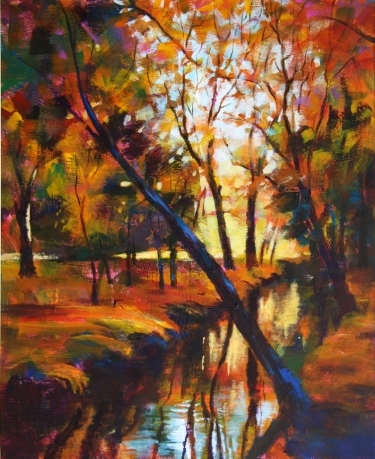 She has held Solo Exhibitions and exhibited widely around the country, including the Royal Academy Summer Exhibition, The Mall Galleries, Watford Museum, Margaret Harvey Gallery, Barnes, Henley Exhibition Centre, Jersey Gallery and many others. She takes part annually in Bucks and Herts Open Studios in June and September respectively.